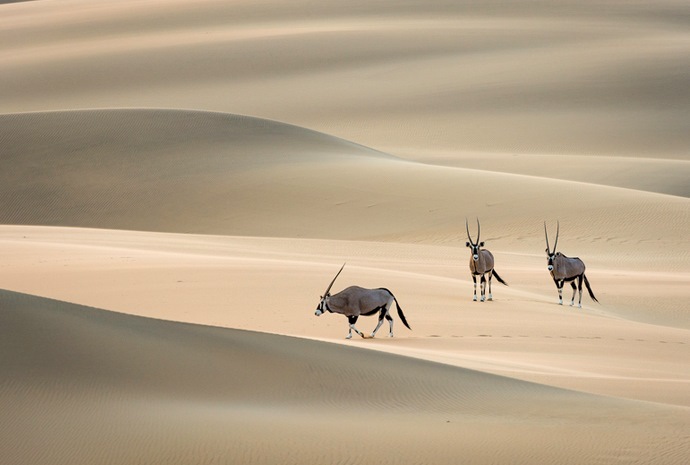 Namibia is a land where a number of remarkable African species have adapted themselves to the very specific climatic conditions of their environment. There are several animals and insects that have adapted, but below we introduce the most significant examples of these. 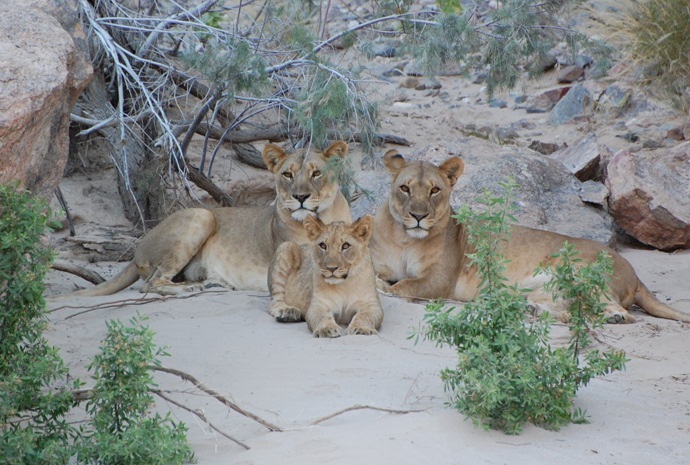 Of course there are many, many more examples so if you would like any more information please feel free to contact us for a chat or to start planning your own Namibia trip where you can witness these wonderful animals for yourself. These elephants differ slightly from their more plentiful cousin, the African elephant. 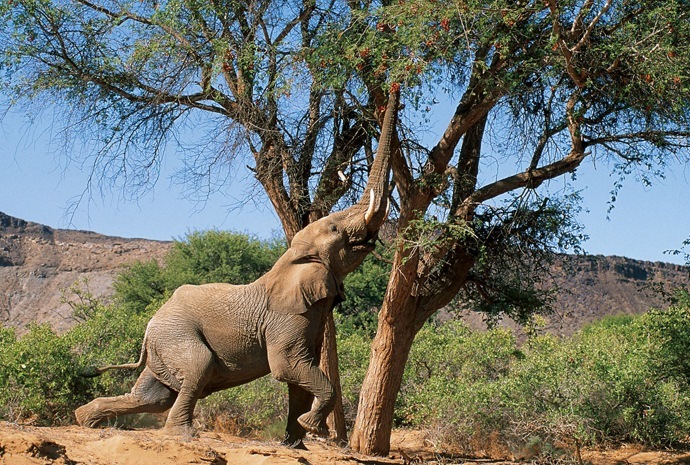 The desert elephants can appear leaner and taller due to their diet and have bigger feet than other African elephants. The larger size of their feet allows them to walk with more ease across the very soft desert sand, an adaptation that is useful as these elephants have been known to travel up to 200 kilometres in search of water. The desert elephants have slightly longer trunks to allow them to dig down into the sand in search of underground water. These elephants only drink water every three to four days. This is a massive reduction when you compare them to the elephants in Etosha that drink up to 200 litres of water per day. The presence of far fewer species of plants as a source of nourishment has resulted in their tusks being more brittle. The rhinos are mostly nocturnal so that they can avoid the excessive heat of the day. 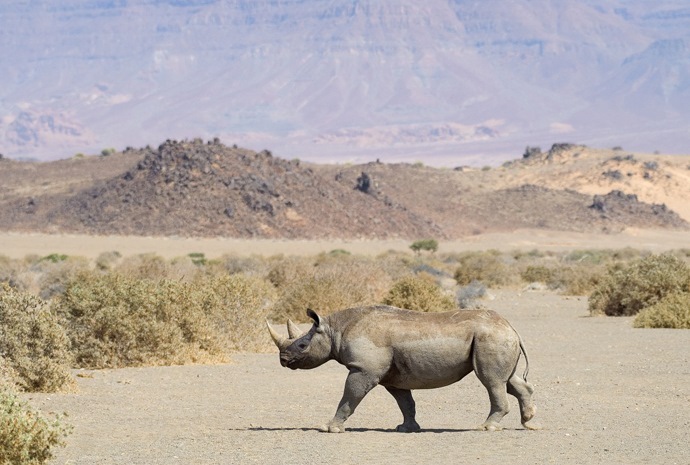 Their horn is slightly longer and thinner than a regular Namibian black rhino, this helps desert rhinos to forage in barren environments. These rhinos are also unlike other black rhinos in that they are usually found on their own and not in small groups. However, the mother will stay with her calf for up to two and a half years which is long enough for her to teach her young how to survive in the tough conditions found in their habitat. The desert lions are genetically the same as the big cats in Kenya, but their evolution has enabled them to survive where their east African cousins cannot. Incredibly, they need very little water and derive most of the liquid from the prey they consume. They feed on gemsboks, ostriches, and occasionally on seals. Their coats are slightly thicker to deal with the colder temperatures and they travel greater distances to find food.